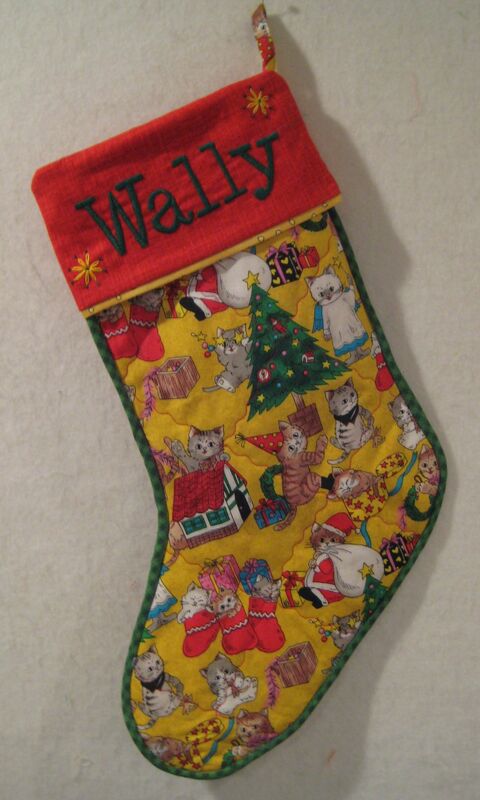 Seeing that Wally was featured in the last post, Bozo and Lucy are requesting equal time. And since their photos are so wonderful, I feel compelled to include them in the tales on this post. 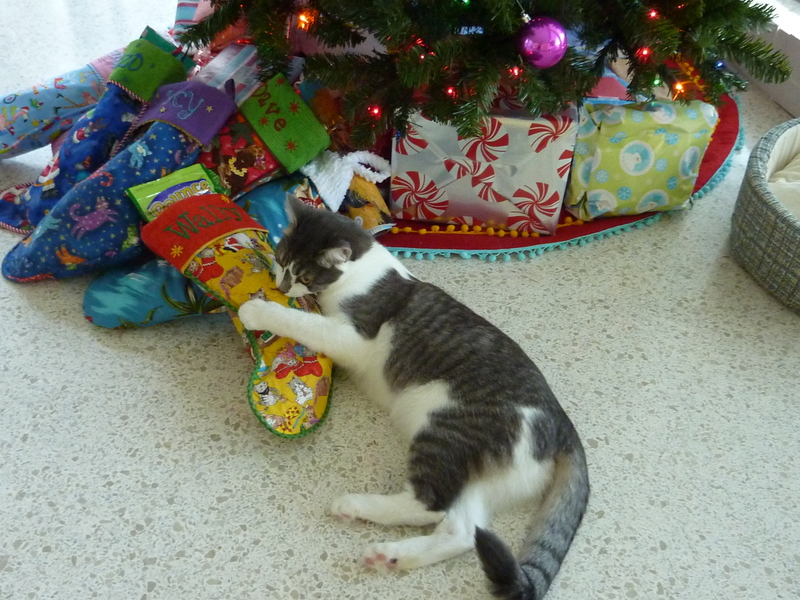 Please indulge; they do so love their stockings. Hope they all enjoyed their holiday in the Florida sun!!!!! 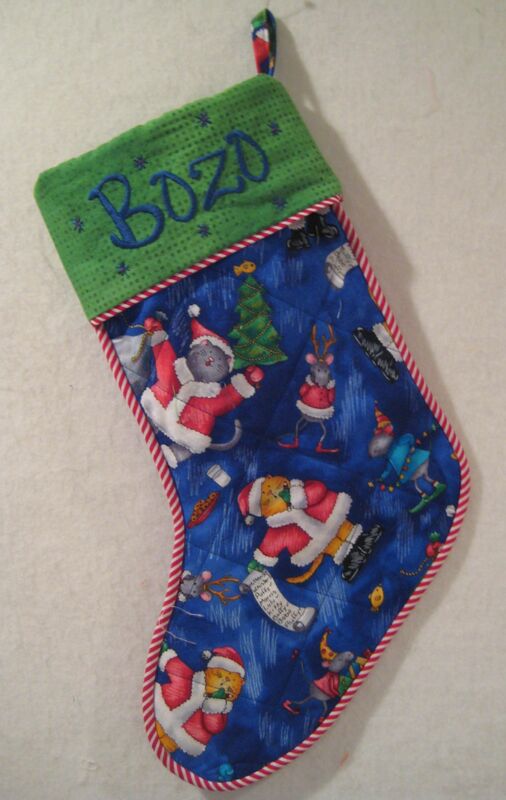 Having seen the Christmas stockings I made last year for Raja and Mrs Potts (posted previously in “A bit of Christmas”), Bozo, Lucy and Wally were heard to mew, “What about stockings for us!?! 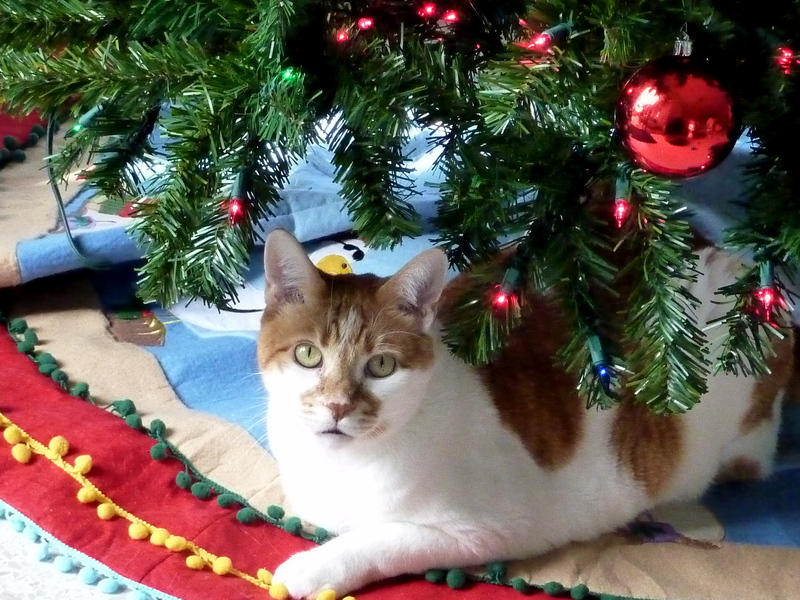 ?” I didn’t actually hear the mew, but it was passed on to me by my brother Dave. 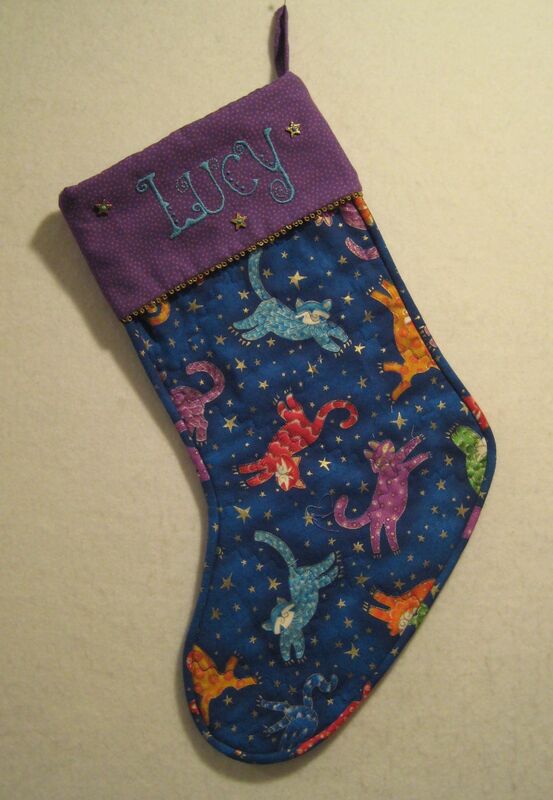 There is only one challenge in coming up with numerous cat gear: finding cat-related fabric that is tolerable, with the additional condition that it needs also to have a Christmas theme. E-bay was the mother lode, as well as the generosity of fellow quilters. 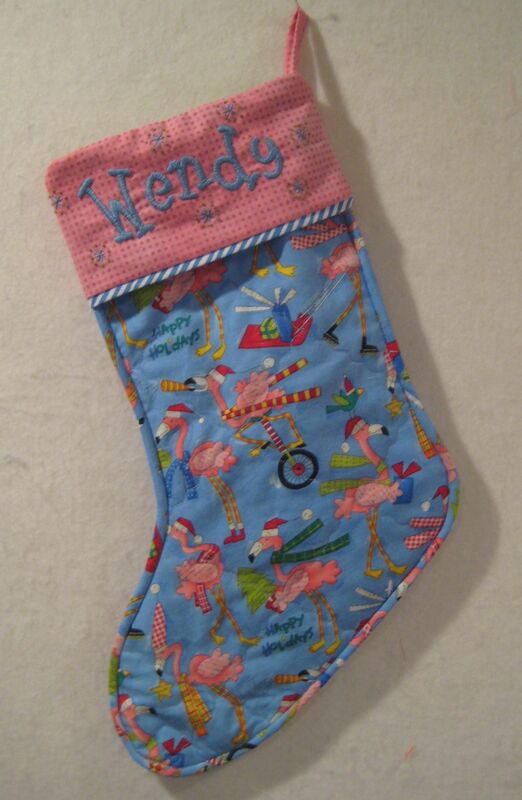 These stocking turned out to be soooo much fun to make, since I could do anything I wanted. And I didn’t stop at the ones for the cats. 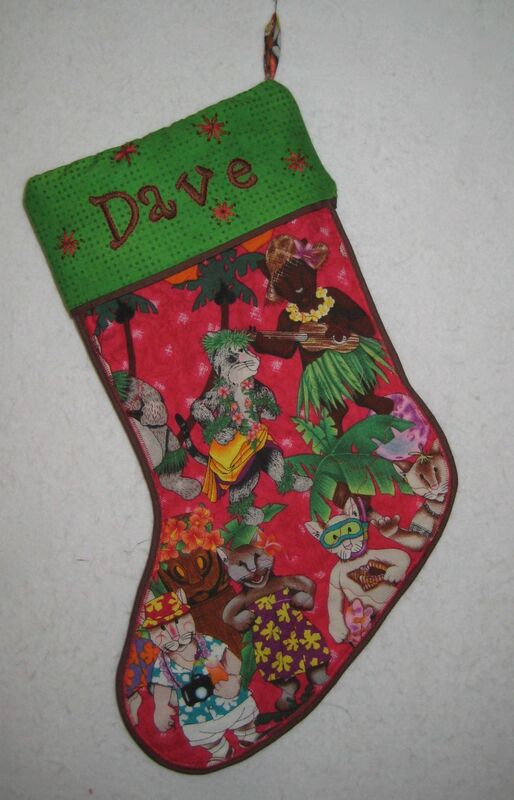 I continued on with tropical themes for Dave and Wendy, too. Try doing something so fun and whimsical. It’s a blast!! Comment about the lettering—-Since I have been asked numerous times, I confess I do not have a special attachment to my machine to make the lettering for the names. It is done the old fashioned way–by hand. Find wonderful free fonts online, print out a name, and transfer to the right side of the fabric using a light box. 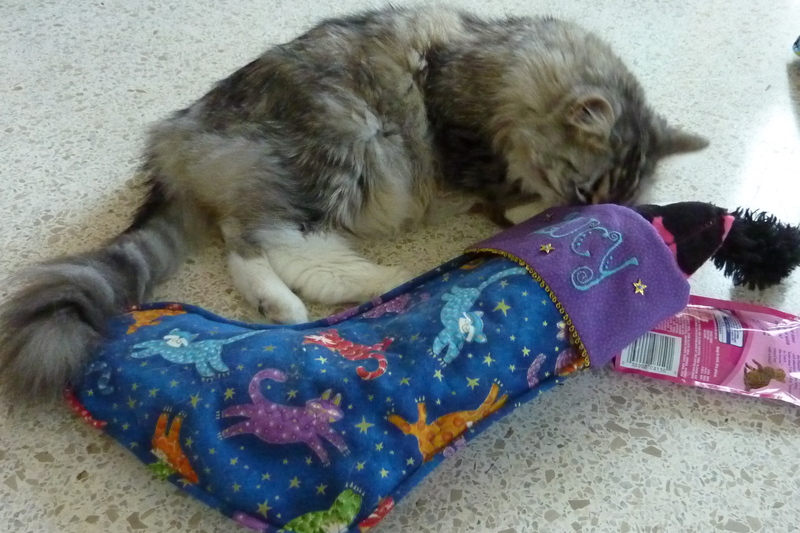 One must be dedicated when cats are involved.
. . . . . the last for now . . . . When collecting fabric for Japanese Pyramids I (see post “Recent Photo Session-Part 2”), I occasionally had to purchase a bundle of samples to get the colors I needed for the quilt. So when I finished both quilts I and II, I had a pile of bright samples leftover, the ones that did not fit into the palettes of either quilt. I tried several times to give away these pieces to friends, but there were no takers. Then, during a fabric stash purge, I decided not to part with the fabrics, and realized that although they did not coordinate with the colors of the original palettes, they might coordinate with each other. On a wonderful sewing retreat in Tahoe with a friend, the new bright triangles made these two small quilts. To differentiate them from each other I added a new (for me) quilting pattern to one of the pair. ………………………………………………………………………………………………………………………………………………………………………………………………It continues to be hard for me to throw away the leftovers from any of my previous projects. I know I walk the fine line between collecting and hoarding, but . . There are just a few more, mostly very recent. I thought that I was finished with this pattern for a while, and then it made a resurgence, in the form of this work and two others. 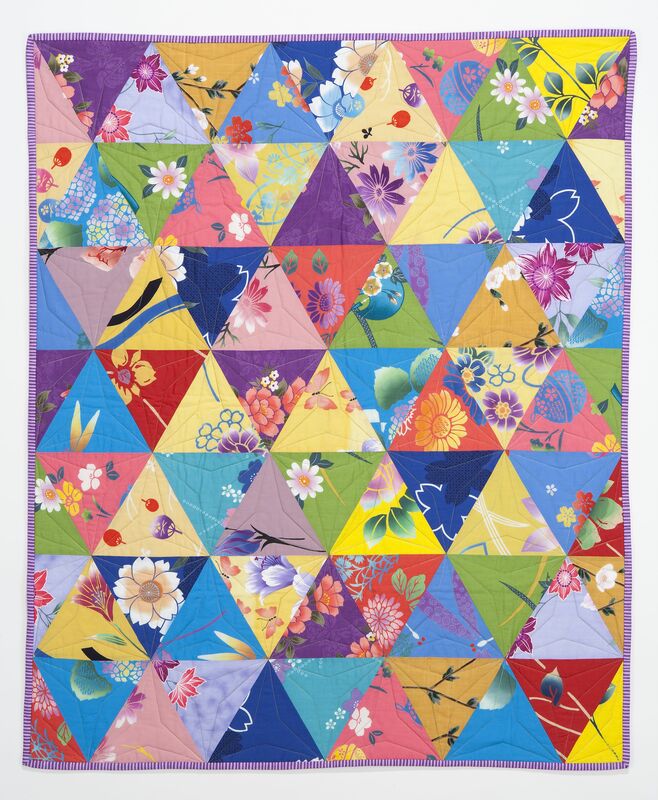 Exhibited in EBHQ’s Voices in Cloth 2010 Show, this quilt was made from a stack of fabric samples, no two the same. This batch of fabric offered me an immediate challenge, the kind of puzzle I love to solve: Will I be able to get all these fabrics in the same quilt in a pleasing way ??? 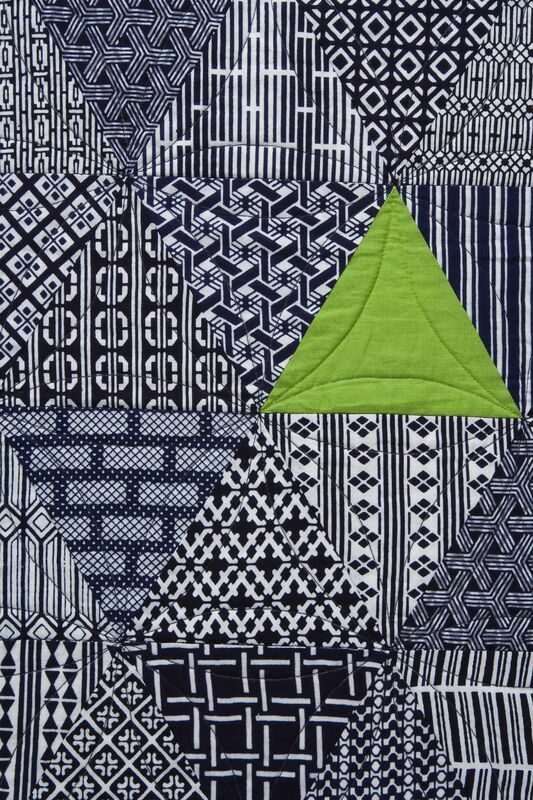 I adjusted the size of the triangle to maximize the number of blocks I could cut from each piece of fabric, thus determining the size of the quilt. At times, working on this quilt was a strain on the eyes. I blinked often, so as to continue to keep my eyes in focus. The quilt finally worked best when I added the three solids. They seemed to stop the eyes from spinning around the quilt forever. The final touch to hold it all together was the addition of the outer borders, very dark indigo, capable of stabilizing the piece. I am often asked how I choose the quilting style for my works that have sooooo much pattern going on in them. Truthfully, it almost doesn’t matter how they are quilted. I am a fan of efficiency, and I’d rather not spend time and effort on quilting that cannot be seen. 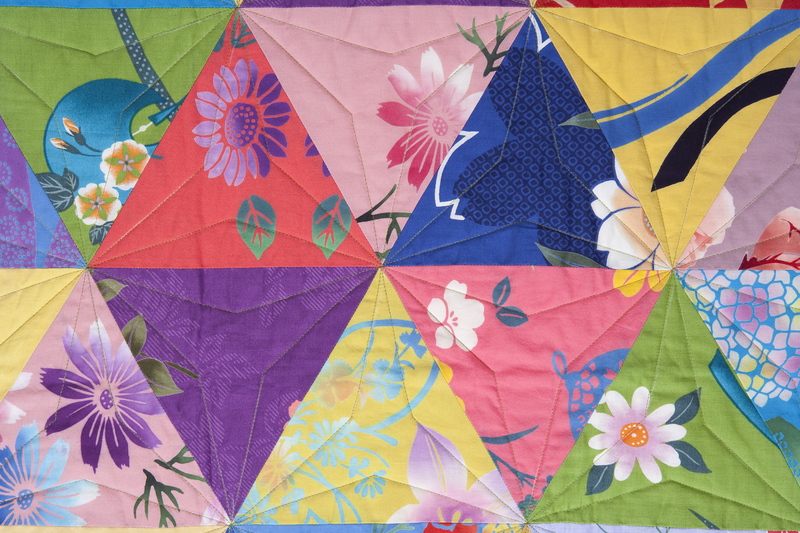 Look carefully at this detail (and even click to enlarge) and see how difficult it is even to find the quilting. Your space-out activity of the day: Click on the large photo, stare at it, and see if you think it vibrates. Our eyes are amazing. Adding a bit more background detail to previous description , and giving Alex her place in this ancient history. . . I came up with great ideas for quilts, and, unfortunately, I loved a few of the creations so much that I could not yet give them away, thus adding more to the work load. This period turned out to be one of my most productive, for which I am most grateful. Making the whole top for this quilt in one weekend retreat at Asilomar in July, 2004, I quickly learned that the quilt went together quite easily when I figured out a few tricks, and I also learned that I absolutely loved the triangles. I briefly considered making a triangle quilt for each of the girls using different fabric families, but dismissed that idea as boring. I wanted each girl to have something special. 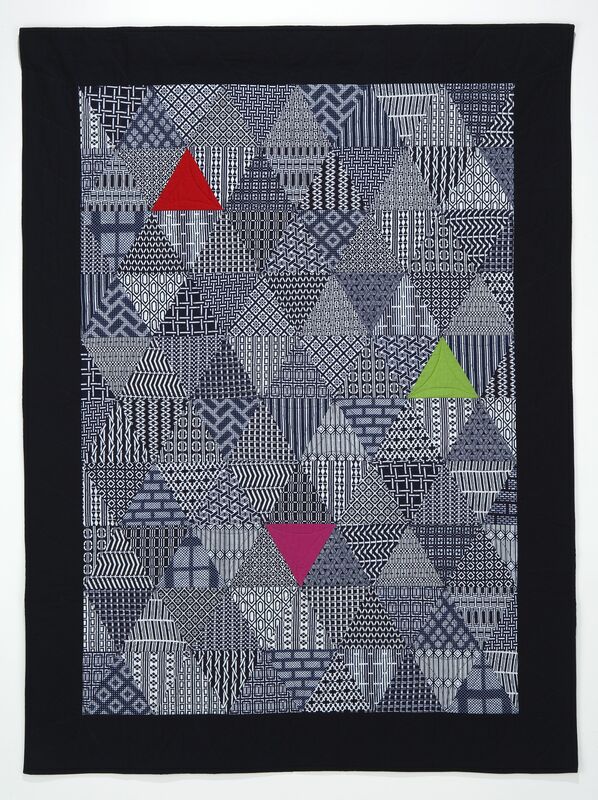 I named this quilt 100 Pyramids, as an homage to the traditional quilt pattern 1000 Pyramids, a quilt made from (perhaps) thousands of much smaller equilateral triangles, a quilt I knew I would never make. Marking and quilting these triangles in flowing curves was the final complement to the overall pattern. 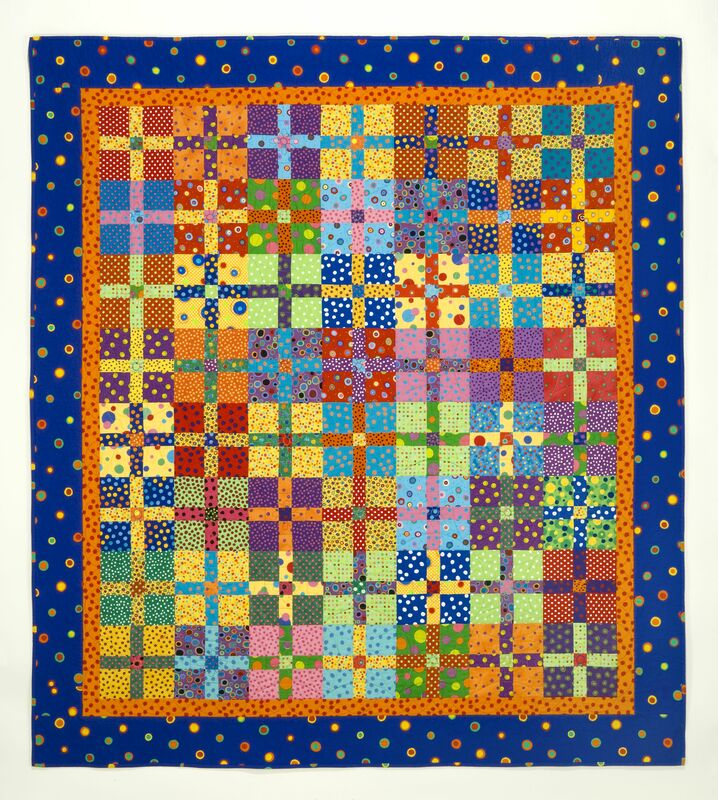 This one quilt was just the beginning in a long series of Pyramid quilts I have made over the years, both for myself, for sale, as gifts, and as samples for the classes I once taught. 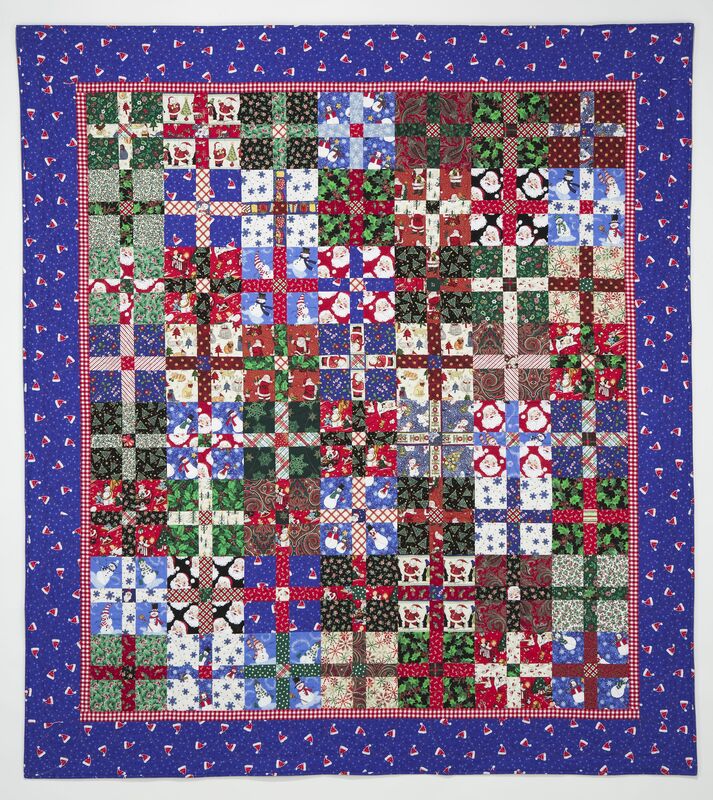 Other quilts are documented in prior entries to this blog, and more are coming soon. 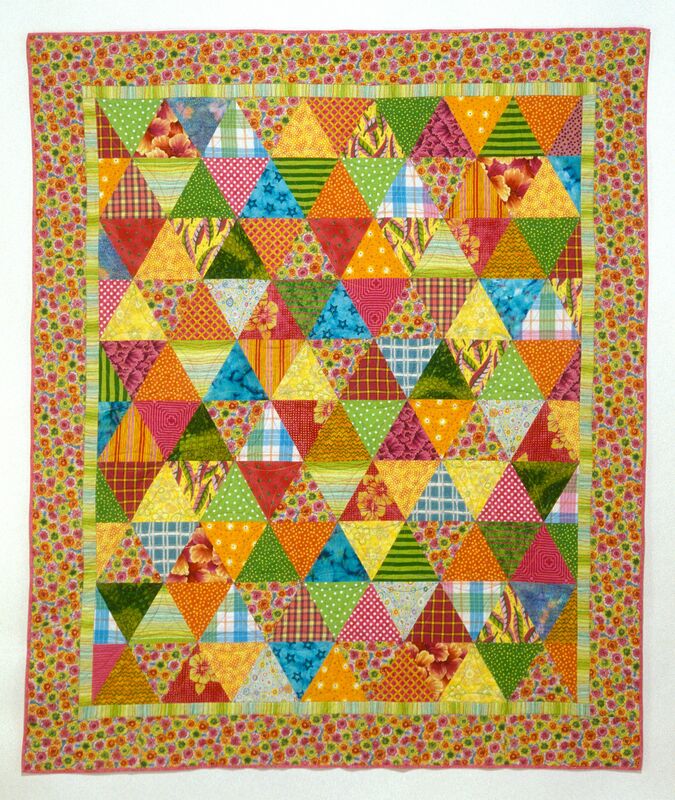 The block I used for Maggie’s quilt was so much fun that I used it again when I wanted to make a new Christmas quilt for 2010. I had gifted two Christmas quilts the previous year, so it was time to make two new ones. I pulled out the wonderful stash of Christmas fabrics (and, no, I don’t know why these fabrics are so attractive to me, just like the Halloween fabrics; I remain clueless and addicted) and started making the blocks. Again, they almost made themselves. Lots of fun. The unforeseen bonus was seeing all the blocks up on the design wall next to each other, now looking like rows and rows of Christmas gifts. Score!!! Great borders were the finishing touch. 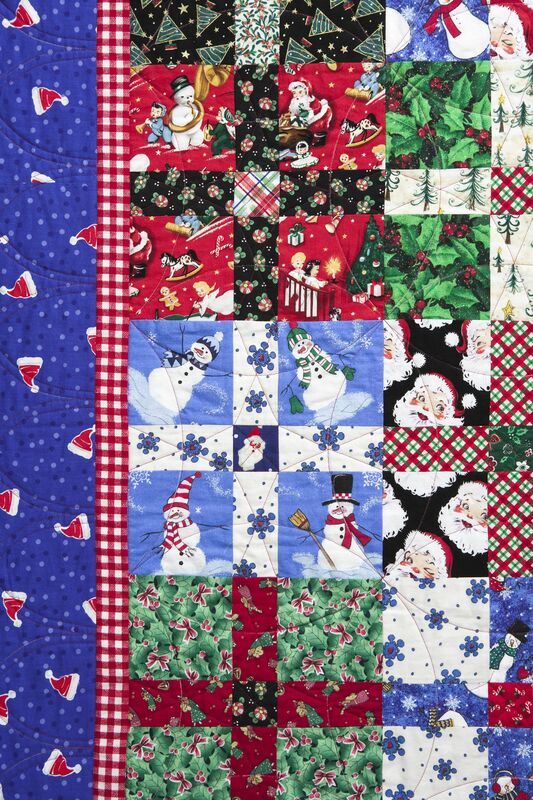 Both the Christmas quilts from 2010 have blue borders, and I think this is a very pleasing look. Looked great up on the wall during the holidays. 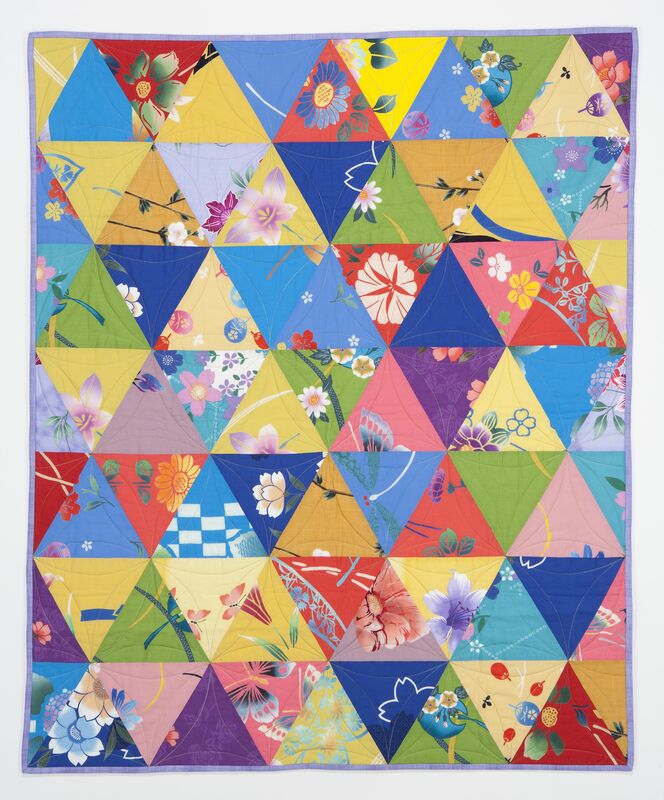 Make this quilt; you will have soooooo much fun. . . . . as promised a fair bit ago . . . . 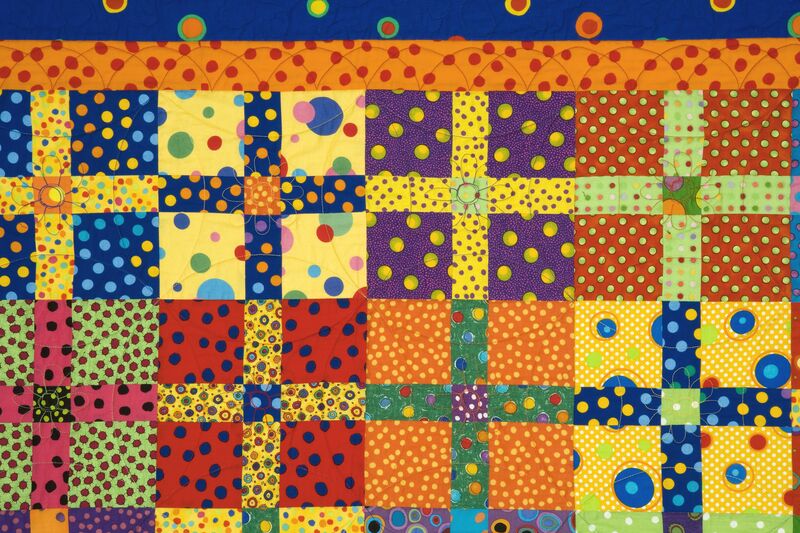 When my daughter Maggie and her friend Danielle were sewing together as pre-teens, they decided that someday they would make a quilt entirely out of dotty fabrics in bright colors. This was the origin of the idea for Maggie’s graduation quilt, because I wanted to surprise her, but she hates surprises. So I asked permission to make the dots quilt she and Dannie had never gotten around to. With a general permission granted, I could now surprise Maggie with the actual quilt, and still know that my project was a safe “surprise” for her. This quilt was so much fun to make; the more blocks I made the more blocks I wanted to make. With such a simple block design, the colors of the wonderful dots began to take over. Holding all these patterns together into the same quilt took a very strong border, and the royal blue used in the border is the only piece of fabric I bought in Paris on a family trip in 2004. And eight more quilt stories to go.